"For the device, which Apple claimed to be its most intimate, to be successful, we believe Apple needs to reach deeper and form stronger bonds with its users" stated Mario Natarelli, MBLM’s managing partner. MBLM, the Brand Intimacy Agency focused on strategy, design, creative and technology, revealed that Apple Watch is polarizing and users feel conflicted, confounded and critical. The agency today released the final set of findings from its year-long ethnography study focused on users of Apple Watch, which also found that most of the panel felt the watch has not come close to achieving its potential, and offers less value than they had hoped for. Dependence on iPhone: This was one of the biggest gripes MBLM heard consistently from the panel. Users say the watch’s dependence on the phone is frustrating and ultimately limits how they use their watch. Additionally, with the phone nearby and behaviors more ingrained, they are more likely to default to using it versus the watch. Narrow Use: All have settled on very narrow and limited use of the features and functions of the Apple Watch. Though this is surprising with such a feature-rich device, the usage did vary broadly, suggesting the watch is able to find a diverse range of comfort zones with users. Lack of Communication: Most of the panel have not heard from Apple regarding their watches. MBLM questions whether Apple missed an opportunity to engage more with early adopters providing tips, news and more apps. Although few hold it against Apple, MBLM believes that the brand may need to be more invested as people generally are becoming more gadget fatigued. Health Data: None of the users expressed concern about health and fitness data being monitored and stored on their devices. Interestingly, earlier in the year, the panel was also not concerned about financial information being available on the watch via Apple Pay. Fitness Failures: For athletic and sports-minded consumers, the watch’s capabilities are insufficient. MBLM believes that because this is a core function of the watch, Apple should do more to provide sophisticated tools. Ironically, the features and information Apple does provide does not resonate or get referenced by users often, perhaps due to ease of use or the quality of the data. No Interest in the Next Generation Watch: No one the panel said that they would definitely purchase the next version of the Apple Watch. Most feel that the updates will not be significant and the cost will not be worth it; however, some did mention that they might consider it if there is a trade-in program. The ethnography study was a year-long examination Apple Watch users aged 13 to 65 years. Overall, findings comprise approximately 1,750 open-ended responses and 50 hours of video footage. 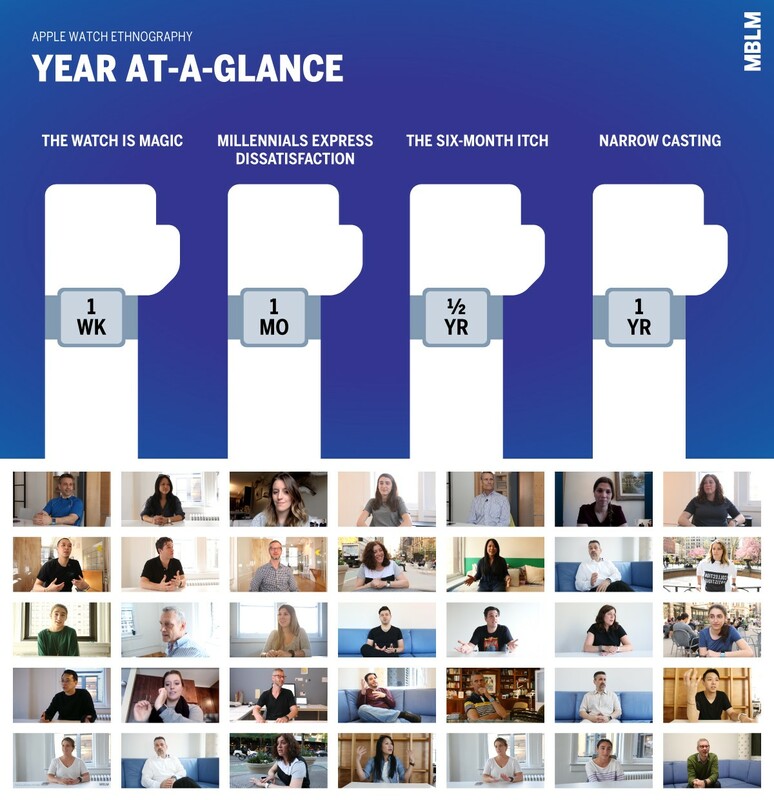 In this one of a kind study, MBLM continued to track and analyze the same group’s use of the watch with the goal to understand how the consumer/brand relationship evolves over time and how technology is changing people’s behavior. For more information on the study, please visit: mblm.com/apple. About MBLM: MBLM is the Brand Intimacy Agency, dedicated to creating greater intimacy between people, brands and technology. With offices in nine countries, our multidisciplinary teams help clients deliver stronger marketing outcomes and returns for the long term. To learn more about how we can help you create and sustain ultimate brand relationships, visit mblm.com.